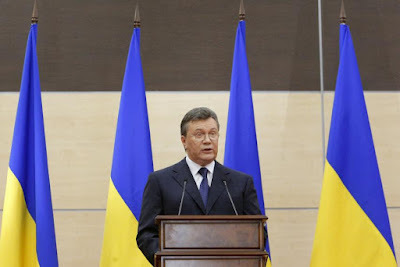 KIEV, Ukraine -- Ousted Ukrainian President Viktor Yanukovych plans to return to Ukraine and assume his old post, the politician’s legal representative told Ukrainian news agency Glavkom on Tuesday. Ousted Ukrainian President Viktor Yanukovich makes a statement during a news conference in the southern Russian city of Rostov-on-Don, March 11, 2014. His lawyer claimed the ex-president was looking to return to Ukraine and assume his previous post. Yanukovych was toppled in early 2014 after months of protests against his pro-Russian government in Kiev’s Maidan Nezalezhnosti square. He fled to Russia and there have been no sightings of him in the country since. An arrest warrant was issued by the new Ukrainian government in the aftermath of the uprising linking him, and other officials, to the “mass murder of peaceful citizens”. Now the former president reportedly plans to return to his country of birth as head of state, Vitaliy Serdyuk, Yanukovych’s lawyer, said. “We have the intention of returning to Ukraine and to this end, legal steps will be taken,” Serdyuk said. “The procedure to remove him from his position occurred with severe violations of the Ukrainian constitution.” Serdyuk said that Yanukovych continues to freely travel as his name is no longer on the Interpol wanted list, however he fears his life is still in danger from Ukrainian authorities. Yanukovych was famously defeated by Ukraine’s first pro-European movement in 2004, referred to as the Orange Revolution. He beat opponent Viktor Yushchenko in the initial vote, but following mass protests and reports of voting irregularities the Supreme Court ruled the result void and held a second election, which Yanukovych lost. He returned to win the presidency in 2010 and remained in power until he was again ousted by the mass protests of the 2014 Euromaidan Revolution. Speaking to U.S. director Oliver Stone after fleeing Kiev, Yanukovych accused the West of orchestrating the protests and claimed he still considered himself the legitimate president of Ukraine. Ukrainian TV channel TSN has reported that Yanukovych currently lives in Russia’s Rostov region but this information has not been officially confirmed.